A North-West London studio based quartet consisting of members best known as producers, engineers and session players, Fickle Pickle was actually a bit of an English psych pop supergroup consisting of Cliff Wade (lead guitar, rhythm guitar and bass guitar) and Geoff Gill (drums) from The Smoke, best known for their late 60’s acid classic “My Friend Jack” along with Wil Malone (piano, organ and electric piano) from Orange Bicycle and Steve Howden (lead guitar, rhythm guitar and bass guitar) from Red Dirt. Vocals for the band were supplied by all four members. The three bands had in common that they recorded at Morgan Studios in London, so it was rather inevitable that the four combined their talents and recorded a handful of singles as well as an LP that received very limited distribution. 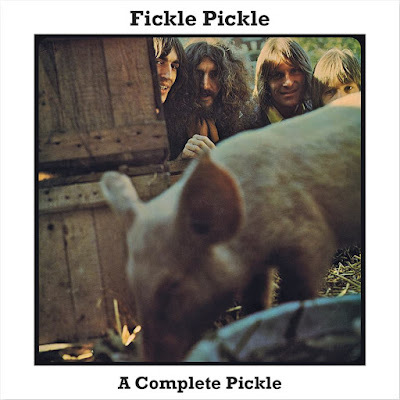 Luckily for fans of the band, albeit some fifty years later, the complete works of Fickle Pickle have been lovingly compiled and annotated by David Wells in a three CD box set aptly titled “A Complete Pickle” released on Morgan Music Co. Ltd.’s Morgan Blue Town imprint. The three discs comprising “A Complete Pickle” are thematic. Disc one contains the twelve tracks from Fickle Pickle’s 1970 album “Sinful Skinful” which was released only in The Netherlands on the Explosion Records label along with nine non-LP single sides issued on various labels between 1970 and 1972. Disc two has twenty six tracks recorded, all but five previously unreleased, taken from the Morgan Blue Town tape library, while the box set’s real treat is disc three which contains fifteen previously unreleased studio tracks recorded during rehearsals for a Dutch tour, making for a total of sixty two tracks, thirty six of which make their debut on “A Complete Pickle” and making for an exhaustive document, nearly three and a half hours in length, of a finely tuned band who most certainly deserved a much better fate than they received. Disc one begins with the LP tracks which unlike their singles, consist of only band originals, with Gill, Wade and Malone contributing the lion’s share of tunes. Throughout the band exhibits its ability to combine gorgeous melodies and beautiful vocal harmonies with skillful musicianship. Produced by Geoff Gill and Cliff Wade, the albums opens with “California Calling” co-written by Gill, a jazzy keyboard driven number that was a mainstay in Fickle Pickle’s live set. Originally released as a medley, the album’s title track, a Wade, Gill and Malone composition is a piano led tune with delicate vocal harmonies and a tastefully restrained lead guitar line, while the medley’s other half “Sandy” is a beautiful ballad featuring exceptional acoustic guitar work. “Doctor Octopus” hints at the heavier side of the band as well as serving as an example of the band’s Monty Pythonesque humorous element. “Let Me Tell You” the opening track on side two of the album begins with more delicate piano and gorgeous vocals before a fuzz guitar enters building to a mid-tune solo giving the tune a much heavier feel. “Down Misty Lane” is the LP’s longest tune at about four and a half minutes and has a Move like vibe with its 12 string guitar fitting perfectly. Two other tracks in particular stand out. The vocal intro of “Sunshine Pie” brings to mind “Western Union” a smash hit by the US band The Five Americans before its tastefully restrained lead guitar line and solo take over, showcasing the rockier side of the band, and the album closing, Beatlesque “Our Time Is Thru” with its fuzzed out guitar leading to another hot solo, the tune being the album’s heaviest without question. As a finishing touch the band’s sense of humor shows once again as at the three minute mark the albums’ credits are read off. A very solid piece of melodic power pop one can only wonder why “Sinful Skinful” was a Dutch only release. With its combination of original material, masterful musicianship and excellent production there was certainly a place in music shops for an album of its quality. Disc one closes with nine non-LP single sides and includes some potential big sellers. The band’s take on Paul McCartney’s “Maybe I’m Amazed” is a prime example, with its piano intro and gorgeous vocals giving way to an uptempo lead guitar leading to a hot solo that plays the song out. With McCartney having not released the song as a single it seems Fickle Pickle’s label missed the perfect opportunity for a hit. The strongest track, however, may well be the band’s red hot cover of the Paul Williams classic “Just An Old Fashioned Love Song” a huge hit in the US for Three Dog Night. From the outset, the lead guitar is to the fore, with the piano, bass and drums all pushing the beat and the vocals much less prominent in the mix. This might just be the best recording of the song to date, and definitely another missed opportunity for a hit. One other single of note was “Millionaire” with its sitar-esque intro, delicately gorgeous vocals and lyrical social commentary. Disc two consists of twenty six tracks, twenty one previously unreleased, taken from the Morgan Studios tape vaults. While the majority of tunes showcase the melodic side of Fickle Pickle and are dominated by keyboards and luscious vocals, there are five tunes in particular that remind the listener that the band was quite capable of rocking and deserve individual recognition. “Playing With Magic” opens with a heavy guitar intro before settling into a driving riff, supplemented by trippy phasing and an especially nice lead line. “Like A Good Man Should” has a driving beat as well as a stunning lead guitar line and solo complemented by Malone’s gorgeous piano interlude. “Ride Ride Ride” has plenty of punch supplied by its heavy guitar intro and stinging lead line, making for quite a snappy rocker. The group’s cover of Neil Young’s “Don’t Let It Bring You Down” features fine piano and organ work by Wil Malone with a smoking lead guitar line and an especially impressive solo, in addition to the band’s ever present melodic vocals. Malone’s “Everyday” is a moody tune which adds strings for texture, while containing even more impressive guitar work. The tunes found on this disc also show the close relationship between The Smoke and Fickle Pickle, as “Guy Fawkes” for instance, was indeed recorded by both bands. In addition, two cover tunes in particular stand out. America’s “I Need You” is especially fitting as it is centered around the band’s vocal harmonies with melodic piano accompaniment. The disc closes with a reggae flavored take on “Do Wah Diddy Diddy” a huge hit for Manfred Mann and another wonderful fit for Fickle Pickle’s luscious vocals. All in all, the tracks found on this disc stand as evidence of the vocal, arrangement and production talents of Fickle Pickle and hint at the possibilities had the band only been able to break through in either the U.K. or U.S. market. The third and final disc of “A Complete Pickle” contains fifteen tracks, all previously unreleased, recorded in the studio in preparation for a tour of The Netherlands, and as such is an incredible document of the band’s musicianship and showmanship. The material is a wonderful mix of band originals and covers, and includes tracks from “Sinful Skinful” and the group’s single sides as well as tunes that had not been previously dedicated to tape but were part of Fickle Pickle’s live repertoire. The disc offers an opportunity to experience one of the band’s gigs, something previously only available to those lucky enough to have seen them on their Dutch tour. The set opens with a laid back, keyboard oriented take on “Maybe I’m Amazed” which may lack the fiery guitar work of the single release, but stands up well thanks to its gorgeous vocals. “Sinful Skinful” likewise relies on keyboards and vocal harmonies but is incredibly pleasant to the ear. A six minute version of Cliff Wade’s “People I Know” makes its debut in any form and does not disappoint, opening with gentle keyboards and vocal harmonies before the lead guitar takes over and delivers a memorable solo. A cover of Carole King’s “You’ve Got A Friend” fits the band perfectly with its mix of keyboards and vocal harmonies. As with the King cover, another track found only among the tour rehearsals is a ten minute plus take on Joni Mitchell’s “Woodstock” best known for the highly charting single release by Crosby, Stills, Nash & Young. The song differs greatly from typical performances by the band straight from its intro. The sound is dominated by its incendiary guitar and heavy beat and includes an impressive mid-tune solo, with Malone’s keyboards, especially his electric piano interlude, adding flavor to what is undoubtedly the heaviest song in the band’s live set. Two tracks taken from the group’s LP “Sandy” and “Down Sandy Lane” return the band to its more mellow, melodic side, showcasing the vocal abilities of the quartet. One of the songs from their unreleased studio demos, “Buena Vista” is a gorgeous mix of tastefully restrained guitars and beautiful vocal harmonies. The group’s humor is present once again on “California Calling” taking the band full circle to the opening track of “Sinful Skinful” and adds a delightfully light hearted break in the action. Following “Let Me Tell You” a track which fluidly moves from its gentle keyboard intro to its more uptempo guitar section highlighted by yet another spright, yet somewhat restrained solo. The set ends with the aptly titled show closer “Time To Go” an uptempo keyboard driven tune yet again showcasing the band’s vocal harmonies and employing percussion in the form of drums and handclaps as an outro. A delightful mixture of up and mid-tempo numbers the rehearsal recordings serve as a teaser of what a joy it would have been to see these four incredibly talented musicians live. Rare indeed is a combo consisting of members, all proficient on their instruments as well as capable of delivering distinctively gorgeous vocals. But such was the quartet which bore the moniker Fickle Pickle. “A Complete Pickle” comes in a tri-fold digipak with each of the three discs tucking into a panel of the digipak. Also included is a twenty four page full color booklet with a detailed essay by David Wells. The booklet contains photos of the band members, artwork of the album and singles releases, as well as press clippings and other memorabilia. The music on this box set sounds crisp and clean thanks to the mastering job by Pete Reynolds. An incredible documentation of a band that was comprised of great songwriters, musicians and producers “A Complete Pickle” has a place in the collection of any fan of early 1970s pop psych music and will be of special interest to those familiar with the band’s who gave birth to Fickle Pickle, namely The Smoke, Orange Bicycle and Red Dirt and comes most highly recommended.